Spoiler alert- I know some people are still just now discovering Lexx (as evidenced on twitter), so be warned that I don't hesitate to blurt. Graphics used in this post are modified screen grabs from The Pic Bug and angelbacchae.com, where you can browse through thousands of Lexx captures from all four seasons. All captures I use in this post click back to sources. Bunny is a conundrum for me. She starts out on the planet Water but winds up being one of Prince's henchmen. How?? How does cute, sweet Bunny wind up playing a star role for the most evil being in two universes? Bunny actually first started out as Laleen in season two's Wake The Dead, and then we see a Brunnen-G stage actor that looks like her in Brigadoom near the end of season two. These two characters (Laleen and the Brunnen-G) played by Patricia Zentilli are unrelated in the overall story, just as Michael McManus playing a different character in season two's White Trash had nothing to do with Kai. Bunny in seasons three and four, however, might be a reincarnation of Laleen from season two, just as Fifi from seasons three and four is a reincarnation of Schlemmi from season two's Luvliner, as recognized by Xev on Xevivor. Is this important? Who knows? They don't stop and spell stuff out in Lexx, you just keep running to keep up. I think it's handy, but we don't need Laleen to figure Bunny out, although I probably will take a look at her. Most of what we (and basically everyone around her) base Bunny being 'good' on is her inability to enjoy people being killed, or seeming incapable of contributing to killing others, to the point of sacrificing herself to save others, as she did in Gondola. I think this is very misleading. Just because she is squeamish and wishy-washy doesn't make her a good person, although she is able to appear the innocent victim everywhere she goes. Think about how she transforms from being almost bossy and cranky with Kai on Water (I'm not sure people who are really supposed to be on Water could become fixated on one person like that) to a cringing fearful mouse in the gondola over Fire. Her personality flipped. At first I assumed it was because she was a fish out of water (ha, pun) and terrified of being on Fire, but some people are just really good at manipulating. This is important. Once you realize that Fifi knew who he was the entire time, and then think back on the unbearable pressure Bunny felt to jump to save everyone, you go Oh, yeah, Fifi figured out who Cupid Kai was on the gondola, so **apparently** (after you've watched seasons three and four a few times it seems more apparent, because the Bunny role was ingeniously subtle) Bunny knew her role as well in the head game that was being played. Just as May was not afraid to die for Prince, neither was Bunny. She acted exactly how she was supposed to act so Stan and Xev could be split further apart taking sides on what was morally right and wrong. For a long time I thought maybe Fifi pushed her out of the gondola, but I don't think he had to. I think she did what she was told, if not with a direct command, at least an indirect pressure. All of the players who obediently died for Prince knew they'd be coming back somewhere later. That was Prince's way of repositioning game pieces, which lends more heft to his arrogance in The Game in season four. By season four Bunny has graduated to First Lady status, partnered with Prince's very own right hand man. Even if you are paying attention, that just seems like an incredible leap. I watched season four all the way through twice before I finally figured Bunny out. It's really difficult to pin her down to condemnation when she so innocently does things like bravely rally the troops in ApocaLexx Now. And she obviously doesn't want people to die when Prince orders her to blow Earth up in Dutch Treat. But that kind of look at Bunny is about as superficial as Bunny herself seems to be. She actually seems to have no problem whatsoever supporting pure evil as long as it lines up with her own selfish obsessions. She had no regard at all for all the moth breeders being killed while she and President Priest tried to steal the key to the Lexx, and even shot some herself in 769. You can follow Patricia Zentilli on twitter and facebook. 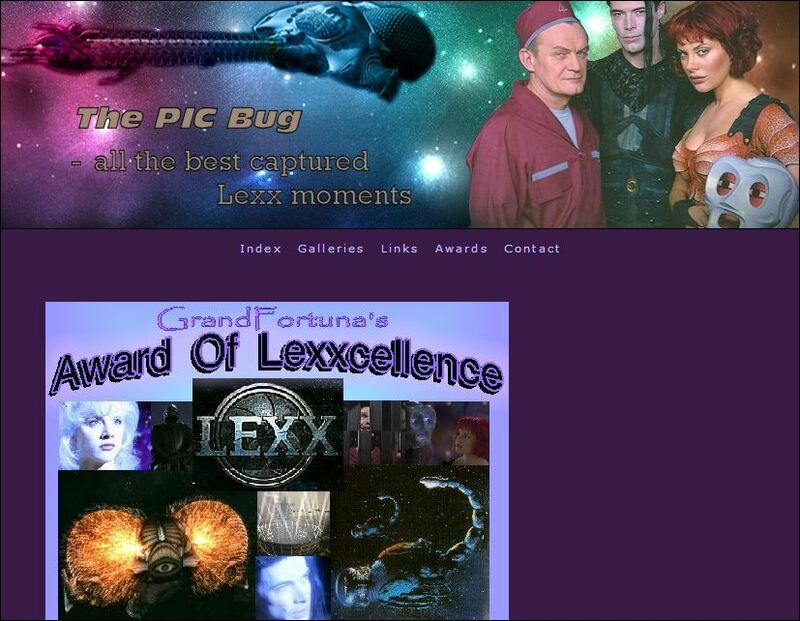 Echo Bridge Entertainment has licensed distribution over Lexx. Online screening is available through a logged in account. Lexx is also available for purchase through itunes, amazon, Inet Video, Google shopping search, Target, Yidio, tv.com, Play.com, Best Buy, and probably much more, now that it's widely available again at lower prices than it used to be.